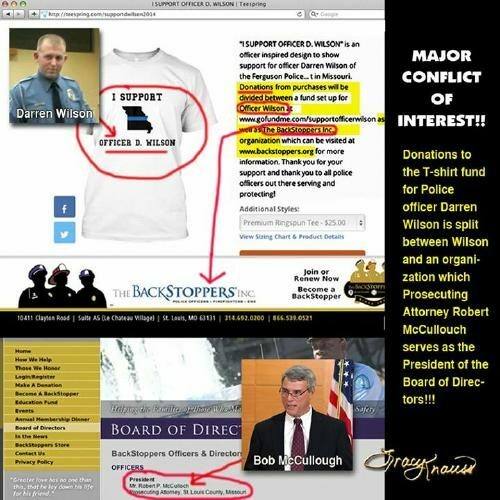 FACT CHECK: Robert McCulloch Sold Fundraising T-Shirts for Darren Wilson? Robert McCulloch Sold Fundraising T-Shirts for Darren Wilson? Did St. Louis prosecutor Robert McCulloch sell t-shirts to raise money for the defense of Officer Darren Wilson? Claim: St. Louis prosecutor Robert McCulloch runs a charity called Backstoppers that sold “I support Ofc. Darren Wilson” shirts to raise money for the policeman’s defense fund. 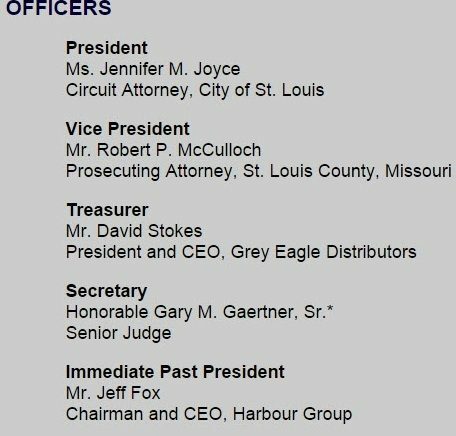 TRUE: St. Louis prosecutor Robert McCulloch was the president of Backstoppers, an organization aimed at supporting the families of first responders in crisis, during the controversy in Ferguson. FALSE: Backstoppers sold “I support Ofc. Darren Wilson” shirts to raise money for the policeman’s defense fund. Money for Ofc. Darren Wilson? Origins: On 24 November 2014, St. Louis County Prosecutor Bob McCulloch announced in the course of a lengthy press conference that a grand jury had declined to indict Officer Darren Wilson in the shooting death of Ferguson teenager Michael Brown. The decision was both controversial and widely criticized, and it intensified existing criticism regarding McCulloch’s putative partiality toward law enforcement officers. Asked Monday night whether he had any regrets about the way he handled the case, McCulloch replied, “No, not at all.” This shouldn’t be a surprise, given McCulloch’s history. That his father, a police officer, was killed by a black suspect doesn’t by itself disqualify him, but his record should have: not a single prosecution of a shooting by police in his 23 years on the job. Four times he presented evidence to a grand jury in such a case and didn’t get an indictment; now he can add a fifth. The points made by the columnist were not unique; in fact they dovetailed with rumors that started in St. Louis in the weeks following Brown’s death. According to claims that began to circulate on or around 15 September 2014, McCulloch’s partiality outstripped even his charitable work and record of not prosecuting officers. “I SUPPORT OFFICER D. WILSON” is an officer inspired design to show support for officer Darren Wilson of the Ferguson Police Department in Missouri. Donations from purchases will be divided between a fund set up for Officer Wilson at gofundme.com as well as The BackStoppers Inc. organization which can be visited at backstoppers.org for more information. The controversy made it to the St. Louis Post-Dispatch by 15 September 2014, at which time the newspaper spoke with Backstoppers’ executive director, Ron Battelle. Battelle told the outlet Backstoppers had not initiated the fundraiser, was not affiliated with it in any fashion, did not know who was responsible for selling the shirts, and should any money be offered from the proceeds to Backstoppers, the group would reject the funds. Contrary to recent posts on social media, The BackStoppers is not participating in or has benefited from any fund raising activity involving the Ferguson matter. We scrutinize our contributions and if we receive funds involving the Ferguson matter, those funds would be rejected by the Board of Directors. Our mission is to provide assistance to families of police, fire and EMS officers who die in the line of duty. We are currently helping 66 families which includes 64 children. This is and always will be our first priority! We greatly appreciate the support of the St. Louis community! Thank You!! Ultimately, only nineteen “I support Ofc. Darren Wilson” shirts were sold during the initial Teespring campaign. It isn’t clear who created the fundraiser or how the proceeds were distributed; but any party is free to raise funds for any other party, and someone’s pledging half their proceeds to Backstoppers does not indicate Backstoppers was necessarily involved with or even aware of the fundraising effort.